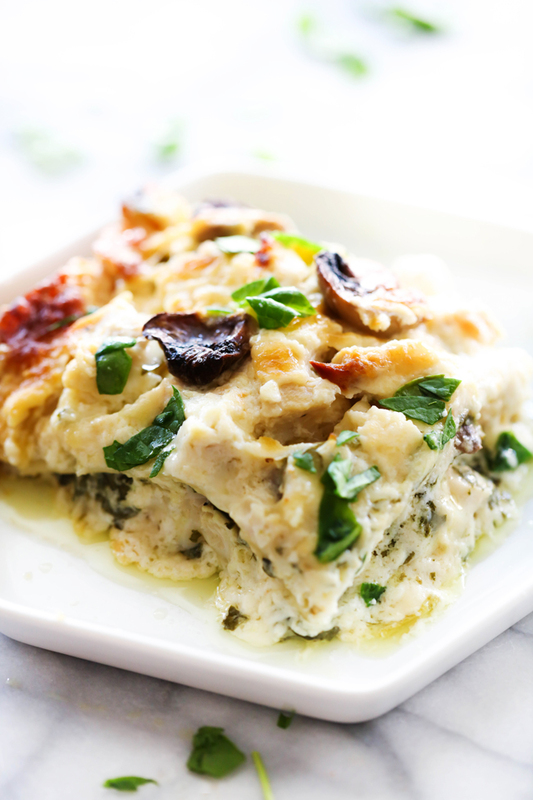 This Spinach Mushroom Alfredo Lasagna is a creamy and rich dinner loaded with incredible flavors and ingredients. The Alfredo Sauce is the best out there with salted mushrooms and spinach throughout the dish. This is a family favorite! This past week has been a busy one to say the least but so much fun. Aside from taking a fun trip, I have also started buying some stuff to get ready for baby girl. I feel like the next 3 and a half months are just going to fly by, but I am so excited for it. Despite life getting busy, dinnertime is still so important to me. I love to make meals I know my kids will eat. Anything beginning and ending with this BEST EVER Homemade Alfredo Sauce will have their instant approval. If you haven’t tried it yet, I highly suggest you do. The reviews speak for themselves. This whole meal was seriously extraordinary. 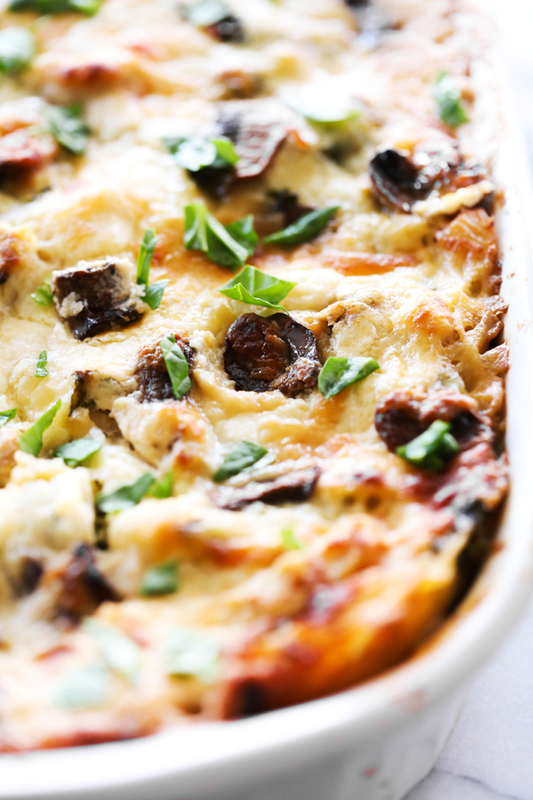 Sautéed mushrooms are my favorite vegetable and they pair so nicely with the creamy Alfredo Sauce. Spinach is also sprinkled throughout each layer and is a great way to get my kids to eat some veggies. Sometimes if they are surrounded by the things they love (that Alfredo Sauce) it is easier for them to swallow :) I on the other hand LOVE spinach. Especially with these other ingredients. 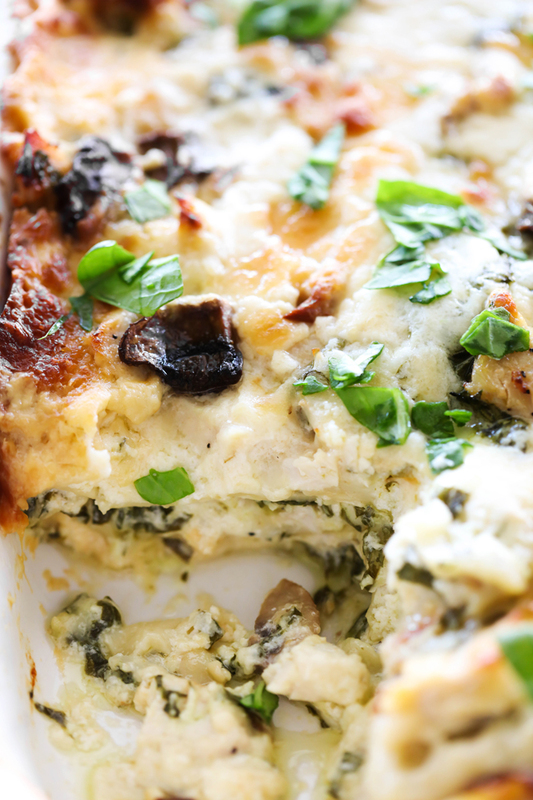 If you are looking for a tasty, flavorful dinner, this is is a fabulous option! It received great reviews and will definitely be one I come back to again and again. In a lage skillet over medium heat, melt butter. Add mushrooms and sautéed for about 5 minutes. Reduce the heat to low and continue to cook mushrooms for about 8 more minutes until tender. Remove from heat. Sprinkle with garlic salt. Drain any excess butter. In a medium sauce pan over medium heat melt butter. Add garlic, cream, pepper, and salt. Bring to a low boil and reduce heat to medium low and simmer for 8 minutes. Remove from heat and slowly add cheese. Return to stove on low and cook for 2 to 3 minutes, stirring constantly. Spray a 9x13 baking dish with vegetable spray and begin assembly. Place 3 lasagna noodles on the bottom of the baking dish. Place ⅓ of the Ricotta cheese over the noodles. Repeat two more times for the remaining two layers. Made this for dinner (sans the mushrooms because the hubby and kiddos are strongly against them ?) and it was absolutely delicious!